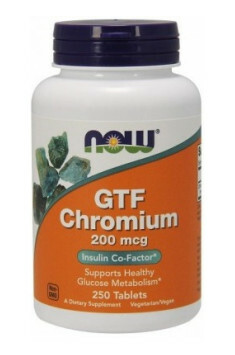 GTF Chromium 200mcg 250 tab. Take 1-2 tablets a day during or after a meal. The daily demand for chromium is estimated for 200 µg. However, it can increase in physically active people and those with hypoglycaemic disorders. The recommended dose for diabetics amounts for 400–600 µg a day. You should remember that in such cases you need to consult your doctor before starting the supplementation. Great divergences between the recommended and toxic doses practically eliminate the possibility of any harmful effects of the element. The product supports the proper functioning of the circulatory system, brain health. Research shows that consumption of EPA and DHA omega-3 fatty acids may reduce the risk of coronary heart disease.